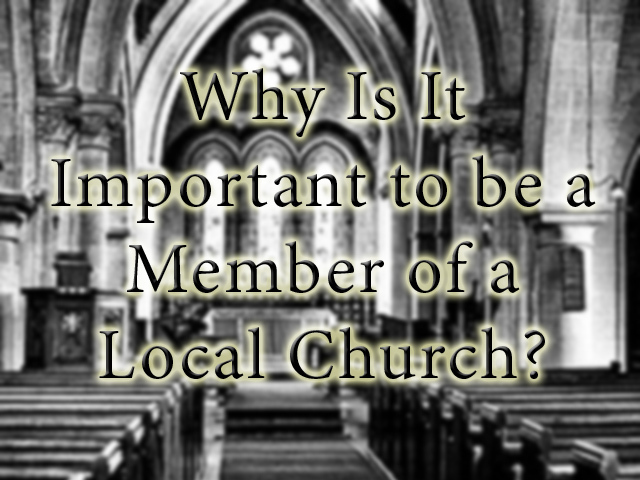 Why Is It Important to be a Member of a Local Church? In Acts 2:42 ff. immediately following the indwelling of the Holy Spirit upon all believers, the believers begin to meet (daily). Luke rarely mentions the Greek word ÎµÎºÎºÎ»Î·ÏƒÎ¯Î± (church) in the book of Luke, but mentions it over 24 times in Acts. So, the church came into existence after Pentecost. While we donâ€™t know exactly what membership in the apostolic church entailed, it was certainly for the purposes of edification, prayer, service, and, as can be seen particularly in Acts 5, discipline. Christianity is a corporate matter, and the Christian life can be fully realized only in relationship to others. The early church shows us that members invest their passions, service, resources, and relationships for the kingdom through the local church. They commit to a holy life characterized by integrity and confession of sin. The commitment to membership means active participation in ministry, in worship, in fellowship, and in service for the mission of the church, along with generous giving and evangelistic living. In the handling of Ananias and Sapphira (Acts 5), as well as Paulâ€™s instructions to the Corinthians (1 Cor. 5:1-5) and the Galatians (6:1) regarding the treatment of sinners, argues for a careful monitoring by the group of the spiritual condition and conduct of the members. While prefect purity of the membership is ideal which cannot be realized within this life (Matt. 13:24-30), open unbelief and sin are not tolerated. Before we get too far into what the church should be doing, letâ€™s look at what the church is not, and then give a clear definition. The Bible speaks of church membership in relational terms â€“ as members of one body and as members of the household of God â€“ so that Godâ€™s people live as a gospel community and help one another grow in Christ and reach others for Christ.Â There are no “Lone Ranger” Christians in the Bible, and there should be none today. 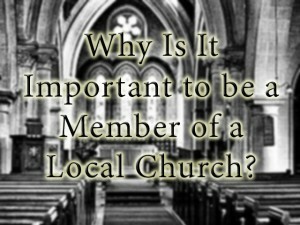 Why should I become a member of a local church? I’m already saved and a part of the body of Christ (universal) so does it even matter if I am a member of a local church? Well, it does matter because we do become a part of the family of God when we receive Christ, and the actual expression of that is found in the New Testament local church. There is not one Christian mentioned in the New Testament who was not connected to a local church. This same lack of commitment to any one church can be found in the youth of today as well. There is a phenomenon of youth jumping from one youth group to another in order to “get their needs met” or to the one that’s “cool” right this minute. They don’t tithe, serve, or have any formal ties to any one youth group. Without this commitment there is no accountability, few relationships where they serve and love one another, encourage each other toward holiness, or have a sense of responsibility toward the group. They have learned this from their parents who either model it for them, or enable them to express this behavior of selfishness. C.S. Lewis once wrote an essay on church membership, reminding us that the word membership is of Christian origin, but it has been taken over by the world and emptied of all its original meaning. Today, most people associate the term membership with paying dues, meaningless rituals, silly rules and handshakes, and having your name on some dusty roll. Nowhere in Scripture does it imply that salvation comes through membership in any church. Luke says of the early church, â€œAnd the Lord added to their number day by day those who were being savedâ€ (Acts 2:47). When questioned about salvation, the apostle never suggested that it depends upon connection with a group of believers.Â When Peter and others were asked, â€œBrethren, what shall we do?â€ (Acts 2:37), the reply was, â€œRepent, and be baptized every one of you in the name of the Jesus Christ for the forgiveness of your sinsâ€ (v. 38). Peterâ€™s message was the same in Acts 3:12-26 and 4:7-12. Paulâ€™s reply to the Philippian jailorâ€™s question, â€œWhat must I do to be saved?â€ (Acts 16:30) was straightforward: â€œBelieve in the Lord Jesus, and you will be saved, you and your householdâ€ (v. 31).Â Â So while there is no link between salvation and membership,Â there is a direct link between sanctification and membership in the local church. 1) It provides a spiritual family to support and encourage you in your walk with Christ (Gal. 6:1â€‘2; Heb. 10:24â€‘25). 2) It gives you a place to discover and use your gifts in ministry (I Cor. 12:4â€‘27). 3) It places you under the spiritual protection of godly leaders (Heb. 13:17; ActsÂ 20:28â€‘29). 4) It gives you the accountability you need to grow (Eph. 5:21). 5) It gives you a place where there are people who will share the burdens of life through prayer, love, sharing, support, and encouragement (Gal. 6:2). Acts 20:28-31; Ephesians 4;11; 1 Timothy 3:2; 1 Corinthians 11:18 ff. ; 1 Timothy 5:16; 1 Corinthians 16:1. Mark Driscoll. Doctrine (Wheaton, Illinois; Crossway) 322. Millard Erickson. Christian Theology (Grand Rapids, Michigan; Baker) 1048. Romans 12:4-5; 1 Corinthians 12:12-27; Ephesians 2:18-19; 3:6; 4:25; 5:29-30. Rick Warren, 101 New Members Class Manual. Bible Doctrine, Wayne Grudem (Grand Rapids, Michigan; Zondervan) 1999, and Biblical Foundations for Baptist Churches, John S. Hammett (Grand Rapids, Michigan; Kregel) 2005.